Explore the point where the Aegean and the Mediterranean meet, not only will you dance to the rhythm of the waves, but also the lively nights. So divine that it was believed to be created by Zeus, the town is beautiful yet boasts authenticity throughout. 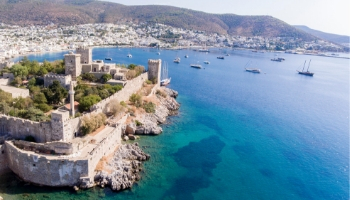 Renouned for its beautiful bays and fabulous castle, Bodrum is as paradisiacal as it is traditional. Discover the place where Asia and Europe join together in this magnificent city decorated by basilicas, bazaars and palaces. Its great infrastructure is only overshadowed by the spectacular hills that guard it, the nearby islands and its crystal blue ocean. 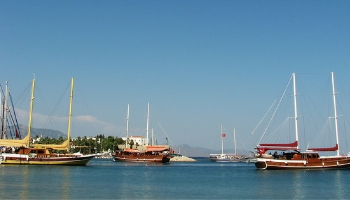 A great starting port to sail the lively Turkish coast, dotted with history and islands of unparalleled natural beauty. Turkey, a unique destination to explore with a boat rental in Turkey. Situated between Europe and Asia, Turkey stands out because of its beautiful beaches and turquoise waters that form their coast. Turkey has access to 4 different seas, with emphasis on the Mediterranean Sea and Aegean sea. 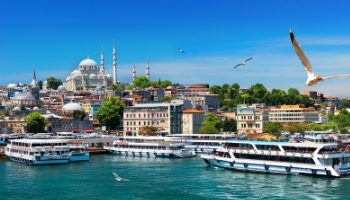 Istanbul is the main tourist attraction together with the mosques, Turkish baths and beaches, forming popular characteristics of Turkey. Renting a boat in Turkey is one of the best ways to discover the destination. We can begin our trip from various ports, like the port Netsel Marina, a port with 750 moorings available for our boat rentals, and boats of up to 40 meters of length and 12 metres of the draft. The port of Göcek has 210 moorings for boats up to 35 meters in length and 7 meters in a draft, as well as different basic services for our boat rentals. 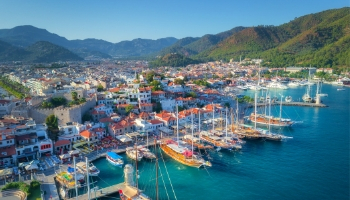 Another option when renting a boat in Turkey is the port Albatros Marina or Fethiye Ece Marina, with 250 and 400 moorings. 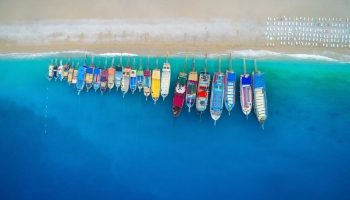 As you sail through Turkey, you will discover its beautiful beaches, such as Antinkum beach, a beach where colours merge into a beautiful print that many choose to take photos of as a form of souvenir of their sailing holiday in Turkey. Gobun beach, located in an opening between 2 cliffs is a perfect place to enjoy the views aboard your boat rental. If you are looking for tranquillity, we can not miss Turun beach, where silence reigns, away from the hustle and bustle of other tourist beaches. Have you decided to sail in Turkey? Then you will be interested to know that the sailing season in Turkey is between the months of May and October, as its warm temperatures encourage sailing beyond the summertime. 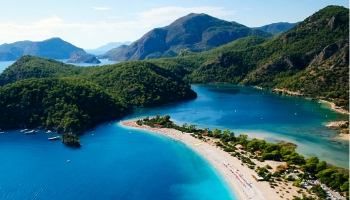 Turkey's average temperature is between 15 and 20 degrees, reaching 30 in the summer. The water temperature is around 12 degrees in the colder months, and 26 in the summer. The predominant winds in Turkey are Meltemi and Lodos. The Meltemi coming from the north, are strong and warm and occur mainly in August; The Lodos winds with strong winds, come from the southeast and occur mainly in autumn and winter, many times bringing along strong precipitation. It is advisable to check the weather conditions whenever preparing a sailing route through Turkey in a rental boat. Although Turkey grants access to 4 seas, the fact remains the same that the most popular area is the Mediterranean Sea, where the tides are generally weak and diurnal. The waves in the winter can become very high. For lovers of travelling by plane, there are multiple routes, as they have airports with international flights such as Istanbul Ataturk, Istanbul Sabiha, Izmir, Ankara, Antalya and Dalaman. Another option is to arrive from the sea starting from Italy or Greece to maximize your enjoyment of your boat rental in Turkey.